D.R. Bendre (1896-1981): Dattatreya Ramachandra Bendre, widely acknowledged as one of the greatest poets in the Kannada language, is a household name in Karnataka. 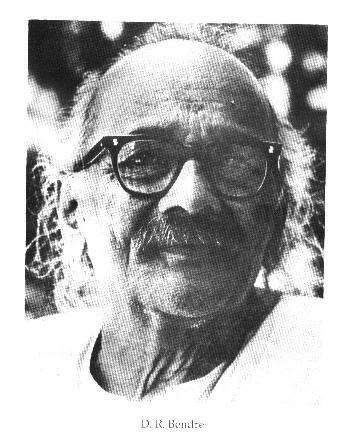 He appeared on the Kannada poetic scene in the early decades of this century with Gari, a highly impressive volume of lyrics, and dominated it for five decades. Though open to influences from all over the world, he was firmly rooted in the Indian and Kannada poetic traditions to which he brought new life and vitality. He received the Sahitya Akademi prize for Aralu Maralu in 1959, the Jnanpith award in 1974, and was a Fellow of the Sahitya Akademi. Secondary Sources (Books about Bendre and his poetry). Many poems by D.R. Bendre transcribed in Kanglish (Kannada written in English) can be obtained in the Kannada Sahitya pages. Please take some time to peruse these pages for they have excellent pointers to Kannada literature. The song moodala maneya which is extracted from Bendre's poem "beLagu". "iLidu bA thAyi": Page 1,Page 2,Postscript. A review of a book on Bendre's poetry (from the Hindu).